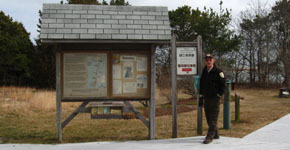 A nature trail starting from the visitor center of The Monomoy National Wildlife Refuge loops through the Wildlife Refuge property on Morris Island. There are several trail markers and informational plaques along the route. The trail starts to the left of the parking area, at a walkway that passes the restrooms. Watch the tides - for a couple of hours around high tide, the beach at the bottom of the stairway is submerged in several inches of water.